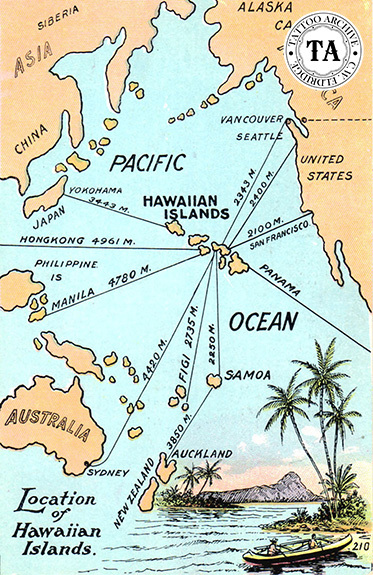 The Hawaiian Islands were original named the Sandwich Islands by Capt. James Cook. As was the style of the day explorers would name new discovered landmasses after their patrons. The Earl of Sandwich was a big help in securing finances for Capt. Cook voyages. An exhibition at the Honolulu Academy of Art in Honolulu, Hawaii entitled "Life in the Pacific of the 1700s" took place in February 2006. This historic event featured 350 different objects collected during Captain James Cook's three Pacific voyages and included items from Polynesia, Melanesia and America's Pacific Northwest. The entire collection is owned by the University of Goettingen in Germany and had never been shown together. However parts had been on display at the Lower Saxony State Museum of Hanover. Yes, we're talking about that same Captain Cook that brought the Polynesian word "Tatatau" (Tattoo) into the English language! Often considered the greatest navigator-explorer in British Navy at a time when the British ruled the seas, Cook and his voyages of discovery added much to the known history of tattooing in the South Pacific. 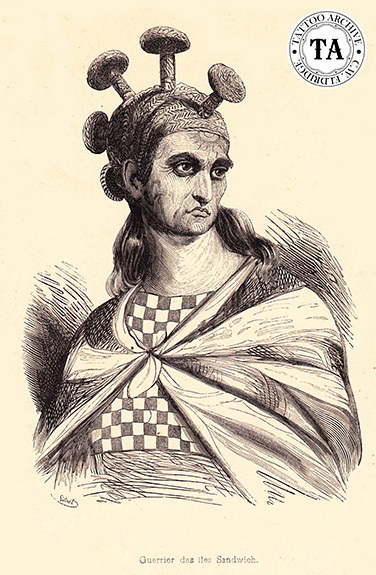 He also brought Omai, the first tattooed Polynesian to England in 1774. 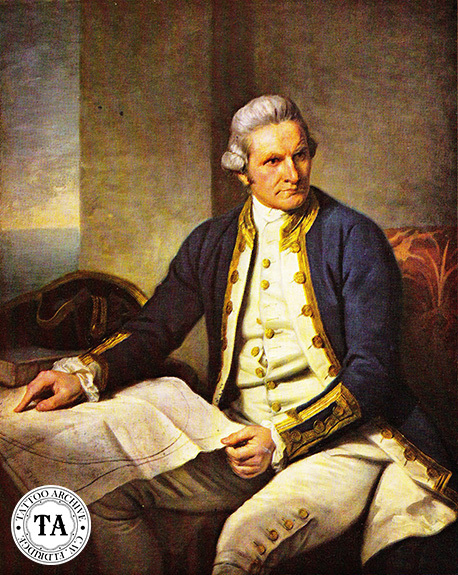 Although beloved and respected in much of the world, Captain James Cook was killed by the natives in the Hawaiian Islands in 1779. This exhibition comes at a time when native Hawaiian groups are at odds with museum officials over the ownership of ancient artifacts belonging to the Hawaiian people. The most vocal of these groups is the Hui Malama I Na Kupuna O Hawaii Nei. This group was formed in 1989 in response to Hawaiian burial sites being unearthed in Maui for the construction of a Ritz Carlton Hotel. Their stated goals are to protect burial sites and to rebury bones and funerary objects that have been taken from these burial sites. The group does have some legal ground to stand on. The Native American Grave Protection and Repatriation Act (NAGPRA) which was passed in 1990 states, "bone, funeral objects and other sacred objects in federal agencies and US museums receiving federal funds are to be returned to their descendants, Native American tribes and Native Hawaiian organizations when federal agencies and museums cannot prove that they have the legal right to own or control them." This law could have a far-reaching effect and may help tribes throughout the main land US and Hawaii recover artifacts taken from them. This is an ongoing battle between the native peoples and museums around the world. In fact, it was not that many years ago when newspapers were running stories about the Maori People of New Zealand fighting to reclaim tattooed heads from several European museums, and Native California tribes were trying to recover ancestral bones from the University of California. The news article about the Captain Cook exhibition stated that the Academy had waived their $7.00 admission fee making this exhibition free. Perhaps they are already feeling the pressure from these Native Hawaiian groups.